Allocate an instance of the DirectedControlSampler to use. This will be the default (SimpleDirectedControlSampler) unless setDirectedControlSamplerAllocator() was previously called. Set the instance of StatePropagator to perform state propagation. Propagation is performed at integer multiples of a specified step size. This function returns the value of this step size. Some systems can only propagate forward in time (i.e., the steps argument for the propagate() function is always positive). If this is the case, this function will return false. Planners that need backward propagation (negative steps) will call this function to check. If backward propagation is possible, this function will return true (this is the default). 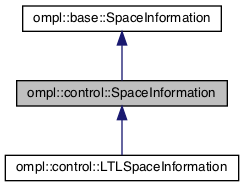 The control space describing the space of controls applicable to states in the state space. Optional allocator for the DirectedControlSampler. If not specified, the default implementation is used. Space information containing necessary information for planning with controls. setup() needs to be called before use. Definition at line 70 of file SpaceInformation.h. Propagate the model of the system forward, starting a a given state, with a given control, for a given number of steps. Definition at line 128 of file SpaceInformation.cpp. steps the number of time steps to apply the control for. Each time step is of length getPropagationStepSize(). If steps is negative, backward propagation will be performed. Definition at line 202 of file SpaceInformation.cpp. Propagate the model of the system forward, starting at a given state, with a given control, for a given number of steps. Stop if a collision is found and return the number of steps actually performed without collision. If no collision is found, the returned value is equal to the steps argument. If a collision is found after the first step, the return value is 0 and result = state. steps the maximum number of time steps to apply the control for. Each time step is of length getPropagationStepSize(). If steps is negative, backward propagation will be performed. Definition at line 147 of file SpaceInformation.cpp. Propagate the model of the system forward, starting at a given state, with a given control, for a given number of steps. Stop if a collision is found and return the number of steps actually performed without collision. If no collision is found, the returned value is equal to the steps argument. If a collision is found after the first step, the return value is 0 and no states are added to result. If alloc is false and result cannot store all the generated states, propagation is stopped prematurely (when result is full). The starting state (state) is not included in result. The return value of the function indicates how many states have been written to result. Definition at line 236 of file SpaceInformation.cpp.